Não perca um dos mais populares passeios de observação de baleias em Maui! Este cruzeiro de catamarã de 2 horas leva você do histórico porto de Lahaina a águas que abrigam baleias jubarte. Usando hidrofones subaquáticos, ouça-os cantar e observe os machos competindo por parceiros ou mães de baleias - você nunca sabe que poderá ver nesta aventura que garante a observação de baleias. Aprecie as vistas do convés superior aberto ou das cabanas sombreadas abaixo e ouça comentários informativos de guias naturalistas a bordo. Este passeio familiar inclui um programa naturalista para crianças. Avistamentos de baleias são garantidos ou você pode fazer o passeio novamente de graça! Great excursion! I loved hearing the whales talk to one another. We saw more whales breaching that day than had been seen in a while. This was an excellent tour. The ship captain and the narrator were very good and knowledgeable. The team was very interactive with those on board, both top deck and bottom deck. On February 24, we saw lots of whales, including a baby whale practicing its breaching. Interesting trip but boat we were allocated to was too big with too many people which strictly limited the viewing opportunities. Just two of us but we were added to a large group from a cruise ship which was not ideal. No prior warning that this would be the situation. Two days previous we had the opportunity to do the activity on a smaller boat, impromptu decision as we feared the weather may close in and that experience outshone this one. Had we not done the previous trip then may have scored the activity higher. Expert on board was informative but the way the boat was manouvered meant that large parts of the boat did not present a view of the whales. Overall whilst a memorable experience the organisation was disappointing. Take a smaller vessel to get the best experience. It was OK, I had thought that I had reserved for the smaller rubber boat tour not the crowed large boat. Crew was very good and knowledgeable. The weather was not cooperative with relatively rough seas making it uncomfortable for several of the guests. Overall it was a good tour and would have probably been great if the seas were calmer. We saw number of whales. They were breaching the water. The staff is very knowledgeable. We were booked on two tours that were both canceled before we actually got on the boat so be flexible. The whales playing in the water is an amazing site. We went early Dec. still not whale watching season, yet we were able to see several of them. The crew was very knowledgeable. Saw lots of whales, Good trip. 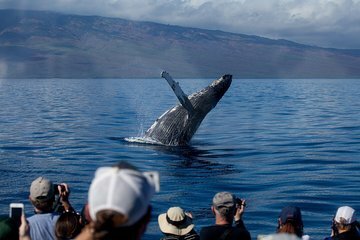 There are lots of options available for whale watching and this tour given by the whale foundation is as good as it gets and you are helping the conservation efforts of this program. The tour my wife and I took was great ---- lots of whales and quality information from the onboard staff. This is a must do while in Maui during the winter months.